Thought I’d share some workout stuff today. 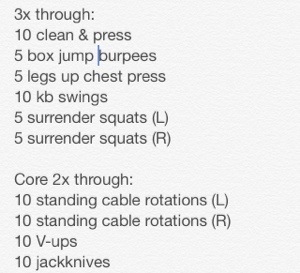 I already posted the workouts I did while in Vegas last week, but I just wanted to elaborate a bit. I know there are billions of posts out there sharing information on how to squeeze in some fitness when you’re on vacation and I’m not about to get all lecture-y on the basics you probably already know. But I DO want to share on how I actually squeezed in a few sweat sessions without my family feeling like I was choosing fitness over family time. 1.I did a deck of cards workout. Each suit was for PUSHUPS, SITUPS, JUMP SQUATS, & 180 SQUAT JUMPS. Best part: My mom was the designated card flipper and announcer. Ok, maybe not the best part, since she was a bit more invested in her glass of wine, but at least she tried. Tyler and my Dad were also in attendance as we were all in the backyard by the pool and soaking up some sun! *note: I was very close to the edge of the pool when I was doing my situps and almost backed right over the edge. Probably would have been the funniest thing ever. 2.My aunt & uncle live on a golf course, and the community has a great walking path that allows you to walk a 2.3 mile circle around a portion of the course/houses. My dad and I left the house together, me going left and him going right. As soon as I met up with him (me running, him walking) he turned around to follow me back. Once I circled around and got back to the house, I turned around again to run back to where my dad was. Confusing to explain; fun to not be alone during a workout. 3.Hiked Red Rock Canyon. Obviously I wasn’t alone. We climbed a significant amount, but my lungs are now so used to Calgary’s altitude, the this particular hike didn’t feel super challenging. In order to take it up a notch, I opted to take the more difficult or rocky paths so I could get a little more glute action. Sunday: Ok, this workout was done solo, so nevermind. Since getting back from vacay last Tuesday morning, I have managed some pretty great workouts as well! Supersets! 3 rounds of each pair w/heavier weights/higher resistance each round: Lat pulldown, bench press; lower than parallel barbell squat, Barbell deadlift, reverse cable crunch, weighted oblique dips. 20 minutes of spin. BV Flow Hot Yoga she TOTALLY changed up the sequence and just when I thought it was going to be one of those slow and steady classes, it was a total burn and I was [happily] dead by the end. Ok, I’m done sharing now. 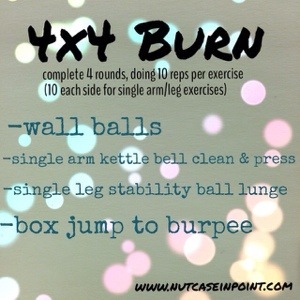 Have any awesome workouts to share? I’m always looking for new stuff!!! Ps: sorry this post is whack, I’m posting from my phone. Womp womp.